w/out risking the new grafts, etc. ? Is it a few days, a week, two weeks, etc? I work with patient care for the Armani clinic. Your question really depends on what technique you choose, strip procedure or FUE. The revcovery time is longer for strip then with FUE. Most people will want to stay inside the first 10-14 days after the surgery to let things heal. After that yo ucan take walks no problem. 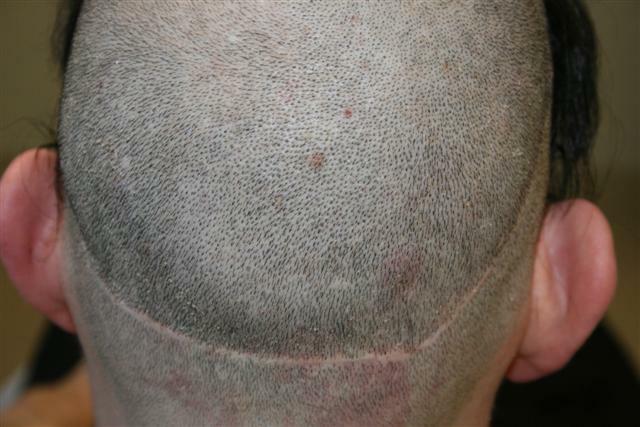 If you decide to go with a FUE procedure you can resume light cadio and weigths 1 month after your procedure. If you go with a strip procedure, alot of doctors wil ltel lyou to wait a full 6 months before lifting weights to let the scar heal. Different doctors have different post car isnturctions,so you will want to double check all of this with your chosen doctor. » time is longer for strip then with FUE. » surgery to let things heal. After that yo ucan take walks no problem. » weigths 1 month after your procedure. » full 6 months before lifting weights to let the scar heal. » double check all of this with your chosen doctor. to wait 6 months is kind of ridiculous, what about cardio, if i go with a strip, how soon can i get back on the treadmill? » strip, how soon can i get back on the treadmill? That is not a “dumb” question but quite a valid one. I am a patient of Dr. Armani and have had both strip and FUE procedures. Working out is also a huge part of my life and a major deciding factor in choosing FUE over strip. When I had FUE I was back to cardio and LIGHT weights after a month, which was much more bearable for me than the 6 months I was off after the strip surgery. And Mr. Frodo…TRUST ME…six months is not “ridiculous”…well I mean it is a very long time to be off the treadmill…but it is very wise to take that advice and stick to it. I didn’t wait the 6 months the first time I had a strip surgery (not with the Armani clinic) and my scar stretched to 1" wide. That was not the only reason it stretched but it certainly made it worse. I ended up going to the Armani clinic for my subsequent procedures as well as scar revisions. I listened to Dr. Armani and stayed off exercise for the advised time and no stretching occurred. So take it from someone who knows…listen to your doctor! The 6 months sound like an eternity to someone who exercises everyday I know but it goes quick and is worth it in the end to have no complications with scarring. » » strip, how soon can i get back on the treadmill? » That is not a “dumb” question but quite a valid one. I am a patient of Dr.
just plain crazy. You can start light workouts at day five with FUE. I would wait 2 weeks for strip. Seriously Armani is over the top with post op. I do not recommend exercising just two weeks after a strip procedure. 14 days after a strip procedure those staples have JUST come out. You seriously chance stretching your scar if you exercise that early. This is my strip scar from 4,000 grafts. 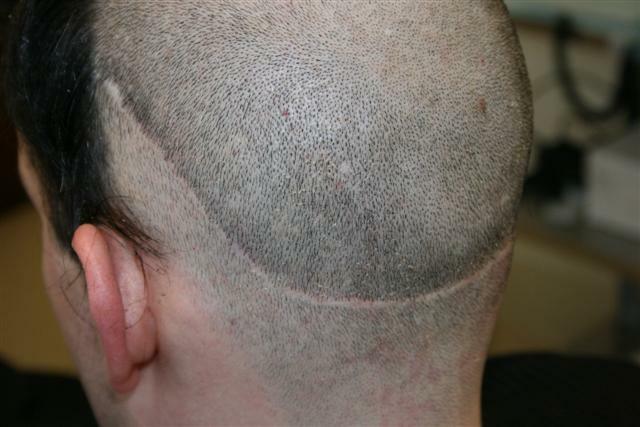 Someone who has a scar in the back of their head like this should not be working out 14 days after their strip procedure. The scar is not even close to 100% healed, it will stretch and widen if you put stress on it. It seems to me that for at least a couple of weeks a guy might ought to chill and perhaps have been in great shape pre-transplant so he can take a good month off from anything approaching strenuous thereafter. One definitely would not want a stretched strip scar if they could help it. That’s a great looking scar, Pats. Thin and clean and even. I just had a FUE procedure done the first week of sept. Its been one month now and I am already back to lifting. It was around two weeks before I started taking walks. I asked Dr. Armani the same question and he said just wait a month so the sweat you produce doesn’t infect the donor sites on back og the head. I can now say its been only 4 weeks and I am back onto my normal routine. For strip with our clinic the following guidelines apply. They have not changed over the years. Wait two weeks for cardio workouts and one month for heavy lifting but standing curls and such are fine by two weeks as well as they exert zero tension in the donor area. The day after surgery is fine. Two weeks but a jaunt to the corner store on your bike is fine in a few days. It’s just the sweating that you want to avoid more than anything. Major iron, like bench pressing refrigerators, one month. In addition, the recipient area (where the grafts are placed) is usually scab free in only a few days. We recommend washing your own scalp even two days after the procedure albeit with obvious care restrictions but by the end of seven days you should be able to wash your hair with the pads of your fingertips with no issues or worries of graft damage. After about four or five days they are locked in tight and are going nowhere. When you leave our clinic you have zero bandages and very little scabbing to begin with. Here is an example of one patient that Dr. Hasson performed a procedure on just two days ago. 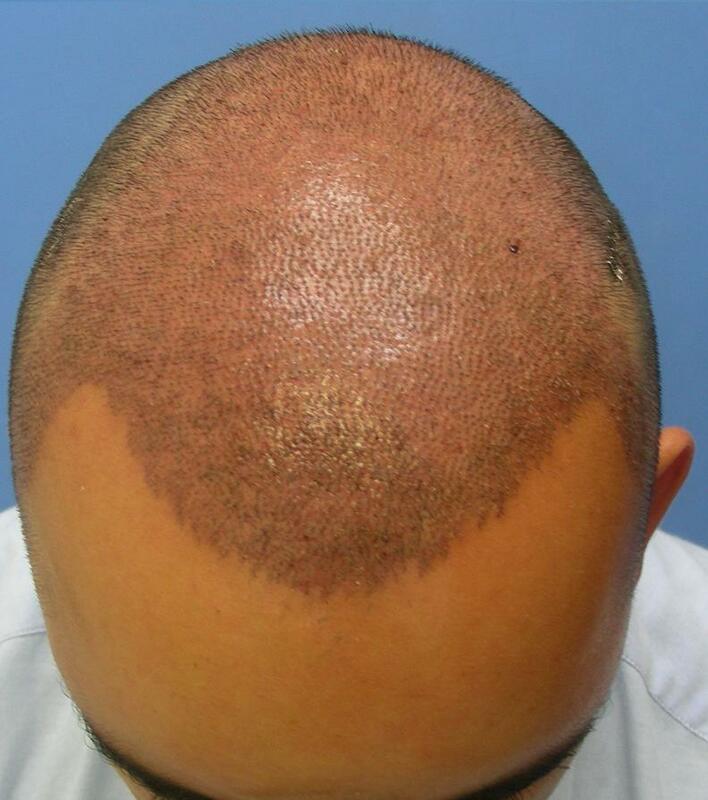 The photo was taken the day after his procedure only TWELVE hours later and after his scalp being washed by one of our technicians. This patient from Spain had 7100 grafts in one session.